Epic poems and prose descriptions of the Trojan War became one of the major thematic sources for the romance literature of the later middle ages. Homer's 'Iliad' was known but considered second-rate in historical accuracy. 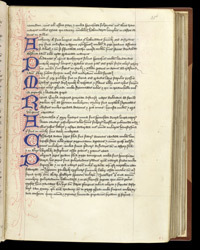 The authorities were thought to be two authors, Dictys Cretensis and Dore Phrygius, of the late Roman empire because medieval scholars mistakenly believed that they wrote before Homer, closer to the time of the war. In 1287, the Italian poet Guido da Columna compiled a long poem, 'History of the Trojan War', in Latin, claiming the two Roman authors as his sources. While it lacked the love story around which Homer created his story, Guido's poem developed more fully a wider range of characters appearing in the Roman stories. This wealth of characters increased opportunities for tales of heroic exploits, which appealed to late medieval literary tastes. Chaucer further elevated one of the heroes, Troilus, in his 'Troilus and Criseyde'. This copy of the 'Trojan War' poem was owned by the benedictine abbey of St Edmund, at Bury. Monks, like nearly all other literate people in the late middle ages, were enthusiastic consumers of romance literature. On this page some of the characters in the Trojan epics are listed.